Russia prides itself as one of the largest producers and exporters of oil in the world, providing nearly 12 percent of the global supply. However, recent history of the Russian oil development reveals numerous challenges that, if not addressed properly, threaten to result in inevitable decline of the oil industry. More than twenty years after the dissolution of the Soviet Union, Russia’s industries are still affected by holdovers from Soviet socialism, presenting both benefits and challenges to their integration with the modern international economy. Russia’s oil industry is especially shaped by these remainders, and as such faces a unique set of challenges in modernizing and adapting to dynamic economic and environmental conditions. 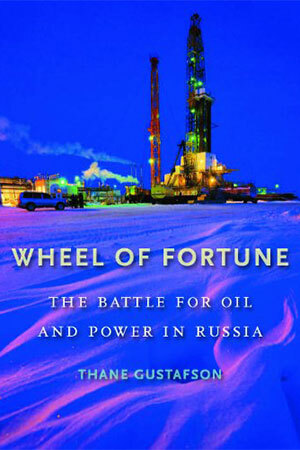 In Wheel of Fortune: The Battle for Oil and Power in Russia, energy policy analyst Thane Gustafson discusses in great detail the history of the oil industry from the collapse of the Soviet Union to today, and lays out the challenges facing the industry as resources become more difficult to find and produce. Failure to confront these challenges, Gustafson warns, will result in insufficient revenues, disincentives for investment, and ultimately a downward spiral that will affect not only the oil industry but also the Russian economy and other states that depend on it. Beginning his analysis at the collapse of the Soviet Union, Gustafson traces the development of the oil industry and the changing state of the Russian government, explaining how their trajectories are inextricably linked. Following the Soviet Union’s dissolution, the central government was comparatively weak and unable to maintain a tight grip on Russia’s industries. Under Vladimir Putin, however, there emerged a stronger central government that demanded more direct control over industry and a larger share of profits. Gustafson presents a detailed analysis of the Yukos affair as a turning point in the confrontation between the government and Russian oligarchs. Ultimately, the dissolution and reabsorption of Yukos paved the way for a state capitalist system under which the majority of assets fall under government control. It was this system that rendered Russia particularly vulnerable to the crash of 2008, during which rapidly falling oil prices temporarily crippled revenues. The crash exemplified the danger inherent in the close relationship between Russia’s government and oil industry: a crisis in the industry means a crisis for the Russian economy as a whole. Such a crisis could come sooner rather than later thanks to a number of factors, most of which stem from Russia’s struggle to modernize and move on from the Soviet system. Most of the oil industry’s revenues come from “rents,” which Gustafson defines as “unearned profit that accrues to the industry above a normal return from innovation and management.” These rents, derived from legacy assets of the Soviet Union, have been a major cause of competition between oligarchs and the state. However, Gustafson warns, the legacy assets are running out, and future oil ventures will be more difficult and expensive to pursue, reducing rents accrued to the industry. Compounding the problem is the current oil tax system, which is based on the assumption of high oil prices and lasting reserves (most of these reserves were developed in the Soviet era). This tax system, Gustafson argues, is incompatible with the inevitable decline in profit, and both the tax system and the reliance on legacy assets need to be fixed if the oil industry is to survive. Gustafson’s evaluation is extensively researched and well argued, and he offers well-reasoned solutions to the problems he describes. His book benefits from a strong narrative that traces developments in the oil industry and the Russian government without shoehorning events into a contrived storyline. Though at times this narrative becomes difficult to follow due to the sheer amount of detail included, Gustafson frequently reminds the reader of the key details and how they fit into his argument, avoiding oversimplification, while ensuring that the book is digestible and effective. Gustafson’s argument revolves around his claim that the industry is stuck in the past, relying on outdated systems to function. While the industry itself must modernize, Gustafson’s recommendations are mainly directed at the government, which must reevaluate and restructure its approach to the oil industry. His recommendations are comprehensive, encompassing a restructuring of the tax and regulatory systems; elaborate modernization efforts; increased willingness to communicate and cooperate on a global scale; and diversification of revenues and reduced reliance on the oil industry for state revenues. Above all, he argues, the oil industry, and the state that largely controls it, must move on from the structures and assumptions of the past to avoid a crisis in the near future. Cambridge, Massachusetts: The Belknap Press of Harvard University Press, 2012. 662 pages.